One never truly knows what a lousy job the blogosphere is capable of until one is at the center of a story. NPR experienced the dark side of the blogosphere this week after management sent a memo to staff reminding them that journalists may not participate in political activities of any kind. Sent Wednesday morning, it expressly said employees could not attend the rallies in Washington on Oct. 30 hosted by comedians Jon Stewart and Stephen Colbert. NPR is "controlling" the private lives of its employees. NPR made this rule up just for the Stewart-Colbert rallies. NPR is under the thumb of Fox News and has ordered its staffers to stay away from the Stewart-Colbert rally because it fears the power of Fox News. NPR has morphed into a right-wing media organ and doesn't want its staff attending what will be perceived as a "liberal" event. Barring staffers from the rally proves that NPR is left-wing because many of its employees would have gone. Yes, these are some of the accusations I’ve heard since Ellen Weiss, head of NPR’s news department, sent the memo reminding staffers that, with elections around the corner, they must abide by NPR’s Ethics Code. NPR has had these rules since 2004. Other news outlets reacted – some making fun of NPR. TBD.com. The Huffington Post. Salon. My phone started ringing. Emails poured in. NPR might have avoided the flood of criticism and the misperceptions if the memo had been worded differently. That NPR intended to cover the events and that the advisory only applied to those considering attending for personal reasons. This would have prevented the public perception that all NPR employees must stay away, so therefore NPR wouldn’t be covering it. That NPR has had these rules since 2004. There’s nothing new here. That the memo was sent because staffers were asking whether a rally hosted by comedians is considered political. NPR executives should have been more careful in wording the memo since they sent it to Romenesko, and therefore knew it would get much wider distribution. [One reason they sent it was to prompt other news organizations to weigh in.] Read Michael Calderone’s Yahoo piece. The Stewart-Colbert rally is a news event. Tens of thousands are expected. NPR will cover it – just as it covered the August “Restoring the Honor” rally hosted by Fox News’ Glenn Beck on the National Mall. Romenesko later amended his posting to note that NPR's ban applied only to those not covering the rally. But by then tweets, emails and links had lit up the Internet. Another problem was that by warning staff not to attend the Stewart-Colbert rally NPR opened itself up to questions on how it handled Beck’s rally and the Oct. 2 gathering on the Mall for the “One Nation” progressive rally. One could draw various conclusions from NPR warning its staffers away from one rally during an election season but not others. Some who wrote insisted that it is now crystal clear NPR is a left-leaning organization because its staffers would not have wanted to attend the Beck rally but might want to attend the Stewart-Colbert rally. Others insist the opposite is the case: NPR must be a right-wing organization because it didn’t prohibit staff from attending the Beck rally. Management said it wasn’t necessary because Beck’s rally was clearly political. I will take management at its word. The memo was sent because some staffers were unclear if the rallies are political. Stewart and Colbert are comedians and entertainers – not politicians. Their shtick is to poke fun at politicians of all stripes, Democrats included. NPR determined the rallies are clearly political. “Rules against participating in political rallies are a cornerstone of journalistic ethics at all legitimate news organizations – and for good reasons,” said NPR CEO Vivian Schiller. “So I'm not clear what all the hyperventilating is about." NPR could have handled this better – and avoided the need to post a defensive blog late Wednesday. Edward Ritz, of Colchester, CT, says NPR’s thinking is wrong for several reasons. Media guru Jarvis agrees with these views. He even encourages NPR staffers to protest management’s decision. “Use social media, folks, and have an opinion about opinions,” he wrote. 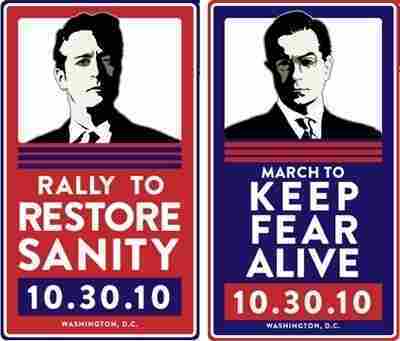 No doubt listeners will be watching closely to see how NPR covers the Stewart-Colbert rally.